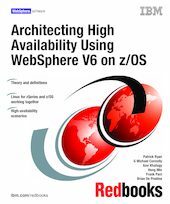 In this IBM Redbooks publication, we describe how to configure the various components of an e-business solution to exploit the availability and scalability benefits of zSeries and Parallel Sysplex using multiple LPARs running Linux for zSeries and z/OS. This publication applies to WebSphere for z/OS V6, and is a continuation of the project evaluating high availability using WebSphere for z/OS V5 and V4. Presented in three parts (theory, systems setup, and availability tests), we cover workload balancing, the use of HTTP sessions, various architectures, and how to set up and test your infrastructures. - Should there be separate front-end systems for running the WebSphere Application Server? - How should e-business components be configured to minimize or eliminate the impact of a system outage? - What is the best way to communicate between the WebSphere systems and the back-end application systems? - What is the impact on the end user if there is a failure in one of the front-end or back-end systems?